The nation wants to know if this is really true! According to reports, senior journalist Arnab Goswami has resigned as the Editor-in Chief of Times Now. Many have been missing Goswami’s presence on his prime time show, The Newshour, the past couple of days and there have been murmurs of the journalist starting his own venture. But there has been no confirmation. Sources said he announced his resignation at an editorial meeting, who also suggested that the resignation follows his desire to start something of his own. Goswami was the Editor-in-Chief and President, News, of Times Now and ET Now. Goswami started his career in The Telegraph in Kolkata. But within a year he joined NDTV in 1995. The journalist led the TV news channel since 2006, and Times Now has maintained the No 1 slot for eight consecutive years, according to an Exchange4Media report. Goswami was recently given “Y category” security cover from the government after the Intelligence Bureau perceived a threat to his life from “Pakistan-based terrorists groups”. He was to get 24-hour protection from around 20 security personnel, including two personal security officers, who will guard him from close distance. As soon as news of Goswami’s possible resignation started doing the rounds, social media platforms – especially Twitter – has been buzzing. Known – and often criticised – for being judgemental on his show and the ‘characteristic high decibel levels’, the reaction to the news has been equally deafening. Arnab quit Times Now. 9 PM to 10 PM will be observed as Earth Hour. Are we as a nation ready for a channel with whole day of Arnab? Arnab Goswami has resigned from Times Now. Because no use of it. PA to boss : sir , arnab goswami submitted his resignation today , ab kya hoga ?? Arnab Goswami resigns from TimesNow, headaches get better between 9:00 and 11:00 pm! Arnab Goswami took the plea to have a noise free Diwali very seriously. He resigned from Times Now. Noise pollution will be down by 80%. 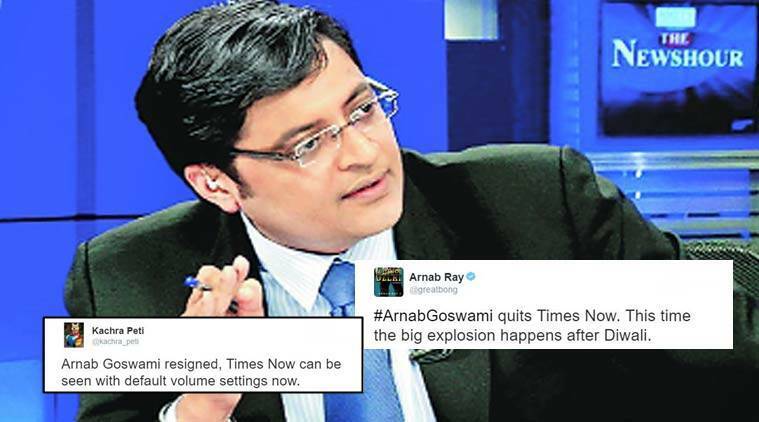 Arnab Goswami quit Times Now….2 minutes of Noise for the loss of channel! Never ever ever never ever ever never ever ever never ever ever break news like this to me ! Arnab Goswami resigns from Times Now? BUT, WE DIDN’T LET HIM FINISH! What is your reaction to the news? Tell us in the comments below. 3 Richa Chadha got trolled for her anti-crackers' tweet; but she's got a fitting reply for them all!